From the Alice Waters cookbook, The Art of Simple Food, I made the Polenta Torta recipe, adding the Wilted Chard variation. It is wonderful. Possibly not terribly photogenic (or maybe that's just me and my terrible plating and photography skills), but otherwise, truly wonderful and simple and good. In a heavy bottomed pot, boil 4 cups of water. Whisk in the polenta and salt. Turn down the heat and stir constantly until the polenta is suspended in the water and no longer settles to the bottom of the pot. Cook for 45 minutes to an hour at a bare simmer. Stir occasionally. Add water if the polenta gets too thick. Stir in butter and parmesan. Taste and add more salt if needed. Keep warm until ready to prepare the torta. In the last 20 minutes or so of the polenta cooking, begin the chard. 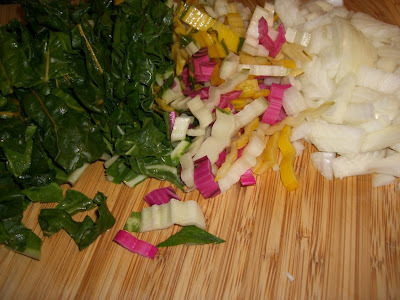 I used rainbow chard because I can never resist the beautiful colors. Wash and drain the chard. Pull the leaves from the ribs. Trim the ends of the ribs and cut them into thin slices. Cut the leaves into wide ribbons. In a heavy pan, heat the oil until shimmering and add the onion. Cook over medium heat, stirring occasionally, until soft, about 5 minutes. Add the chard ribs and continue cooking for three minutes. 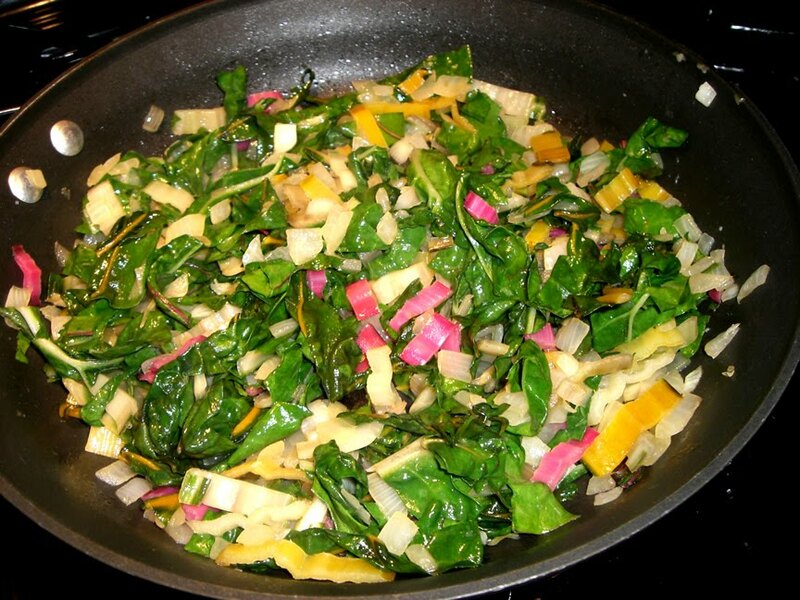 Add the chard leaves and salt. Cook, stirring occasionally, until the leaves are tender. Add a bit of water if the pan gets dry or the onions begin to stick or brown. 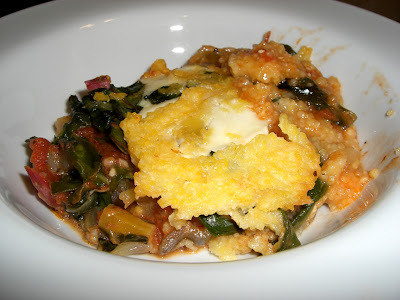 When both the chard and polenta are ready, you will begin to prepare the torta. It is important to prepare the torta as soon as the polenta is ready, otherwise it will begin to set. You need the polenta to be soft and spreadable. Oil an earthenware or other low-sided baking dish. I used a 9x13 and questioned afterwards, whether it was too large. A slightly smaller one might have been more appropriate. Alice Waters does not specify. Ladle in 1 1/3 cups of soft polenta and spread it over the bottom of the dish. Spread 1 cup of tomato sauce over the polenta. On top of the tomato sauce, arrange half of the mozzarella slices. Sprinkle with half the grated. Parmesan cheese. Layer half the chard. Over the chard, ladle another 1 1/3 cups of soft polenta, spread on the rest of the tomato sauce, then the mozzarella and Parmesan and the remaining chard. Ladle the remaining polenta over the top. Allow the torta to sit for 30 minutes before baking to allow the polenta to set. Preheat the oven to 350°F. 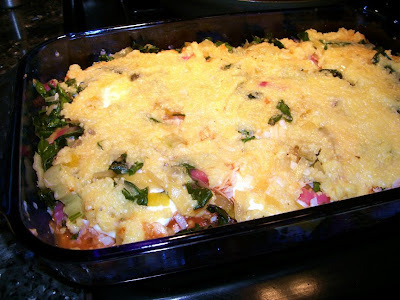 Bake the torta until hot and bubbling, approximately 30 minutes. Nice...I think all of AW's cookbooks are written to encourage improvisation, unlike so many cheffy/restaurant books.